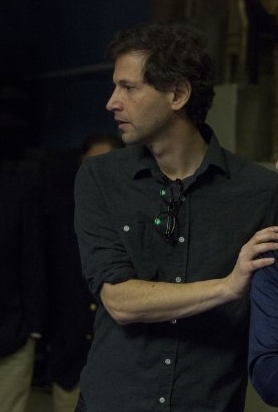 How glum is FOXCATCHER, the new movie directed by Bennett Miller (shown below), who earlier gave us Moneyball and Capote? One of the "grayest" movie ever made in color (I don't recall the sun's shining even once, and if you can find a character smiling or happy, do let me know), even when the wrestling champ played by Channing Tatum wins his big match, the sense of dread and doom that hangs over this film is palpable. Granted, the story here -- of the nutcase du Pont heir who took the wrestler under his "wing" and then for good measure took in his older brother as trainer -- is one of the crazier in America's storied history of the damage, personal and societal, that cracked wealth can wreak. No wonder nobody's smiling here. The screenplay, by E. Max Frye and Dan Futterman, follows pretty closely the news story I recall from the late 1980s, when the events took place. What does not seem to be explored in any depth but is clearly suggested is how the behavior of the rich in our society is pampered, enabled and excused by everyone around them -- from their employees to their peers and even the local police. The results of this are shown here in all their cruddy glory. The rich, in this case, are personified by Jean du Pont (Vanessa Redgrave) and her son John (Steve Carell, shown below), and both actors do what they can by the fairly proscribed roles that allow them mostly a single note: in Ms Redgrave's case, it's rich/restrained, in Mr. Carell's it's rich/nutty. Much has been made of Carell's hugely changed facial appearance via a prosthetic nose, and if the Academy follows its usual path of honoring prosthetics over performance (Monster and The Hours are two examples), we might see an Award in sight once again. (Carell, a fine and versatile actor, does everything he can with his role, but the screenplay's lack of exploration of his character (beyond a rich momma's boy) leaves him somewhat stymied. Mr. Tatum, above, adds another feather to his growing cap of fine performances. He's definitely the saddest character on view, with no life to speak of except his sport: he's got a bleak history and probably an even bleaker future. Times were perhaps a bit better back in the 80s than they are now, but in any case depression seems to reign over all. Foxcatcher (the title comes from the name of the DuPont farm, later doubles as the name of the Olympic training ground the farm becomes) is a mostly male movie; the only women we see much of are Redgrave's closed-off mother and Dave's wife (played by Sienna Miller, above), who is also shown to be unhappy most of the time. 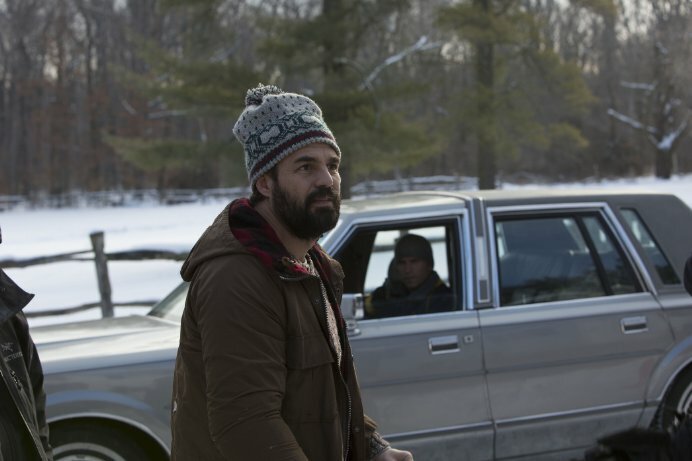 Bleakness even hangs over the few scenes of family fun that Dave, his wife and kids engage in. 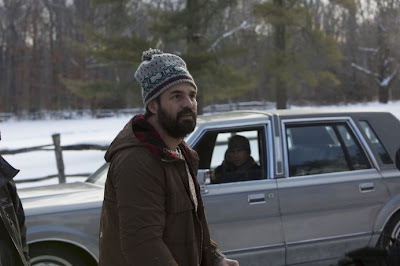 I can appreciate Miller's and his screenwriters' aim to give us a kind of peculiarly American tragedy in the making, but I wonder if their constant insistence on the glum does not begin to make the film feel too manipulative. Even into the bleakest of lives a little joy sometimes falls, but you'd never know that from what we see here. 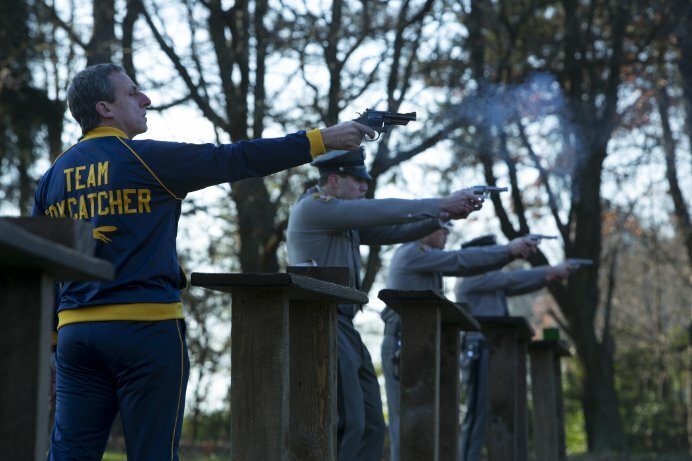 Never uninteresting, though a certain sameness does eventually sink in, Foxcatcher is definitely worth seeing. Some of the Hosannas we've been hearing, however, seem a tad out of place. 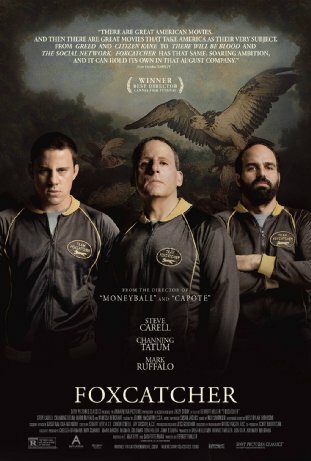 From Sony Pictures Classics and running a lengthy 134 minutes, Foxcatcher opens this Friday in Los Angeles (at the Arclight Hollywood, AMC Century City 15 and The Landmark) and New York City (at the Regal EWalk 13, AMC Lincoln Square and the Landmark Sunshine), and will open nationwide in the weeks to come. To see all currently scheduled playdates with cities and theaters, click here and scroll down.